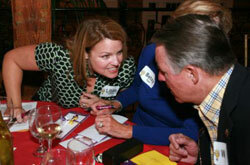 The Smarty Pants Soiree offers an evening trivia contest, pitting friends against friends and companies against companies. It's all in fun and the true winner is the Greensboro Public Library, where the money raised is used for children's services. 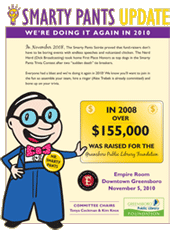 The Smarty Pants Soirée fund-raisers have proved that people love to compete in trivia contests, especially if it means raising money for children's services at the Greensboro Public Library. 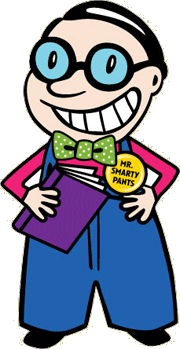 Held in 2008 and 2010, the Smarty Pants Soirees raised more than $200,000 for the Greensboro Public Library Foundation. 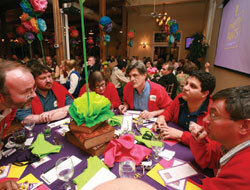 A table of eight people forms a Smarty Pants team. 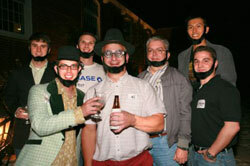 Corporations sponsor teams; individuals gather their friends to form a team. 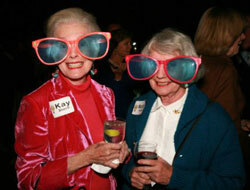 The money raised from the Smarty Pants Soiree goes directly to children's services at the Library. The Greensboro Public Library Youth Services offers children endless possibilities for learning. The Library's many programs are designed to provide children and teens with entertaining, educational experiences whcih strengthen academic growth and nuture a love of reading..
MAKE THE FUTURE BRIGHTER - Books allow children to escape to another time and place while improving their minds. With your help, you can provide the children of Greensboro with a solid foundation for reading. SUMMER READING - The library sponsors a summer reading program that incudes incentives and entertaining programs designed to keep kids reading. PRESCHOOL STORYTIMES - For children ages birth to 5, the library sponsors weekly story programs which develop early language skills as well as to engage young children with the fun of books.. PROMOTING LITERACY THROUGH ART - The Hemphill Branch Library combines art with learning. 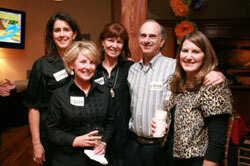 Hemphill offers traditional library services plus art exhibits and the ArtQuest studio. AFTER SCHOOL LEARNING EXPERIENCES - Each branch sponsors after-school and outreach programs which offer school-age children a variety of interactive educational opportunities such as hands-on science, creative makerspaces, cultural celebrations, book parties, Lego construction clubs and more. FAMILY EVENTS - These all-ages programs are frequently held on weekends or evenings drawing families to the Library for quality entertainment and activities that the whole family can enjoy. TEEN PROGRAMS AND SERVICE LEARNING - Teens can find a variety of programs designed especially for them including film-making, computer programming, technology and 3-D printing, financial literacy and entrepreneurship, creative makerspaces, teen clubs, gaming and more. Teens can also earn Service Learning hours through volunteer opportunities at Greensboro's libraries.